yadda yadda yadda? Oh your forgot... drool, envy, admiration...this is wonderful. I like your tricky photo too with the reflection. I bet you will feel and look great wearing this. Love the meaning of every element you used and the colours. Thanks for your visit(s) my daughters op is now the 15th of sept (dare I believe it??) and although she is getting the care she needs she is in pain every day. Saddens a mothers heart...but your reminders that we are thought of helps. And yes it would be FABULOUS to have a big ol creating session together! Holey Catfish Batman, this is soooooo stunning! I know it was frustrating to make but my oh my it is awesome! I am totally jealous! I finally got some metal-working supplies and I am not sure were to start or what to do! Whatever. Can I have it? Will it fit me? Make it fit and ship it to me right away. Thanks, dear one. Came by to say hi & enjoy the rest of summer days! 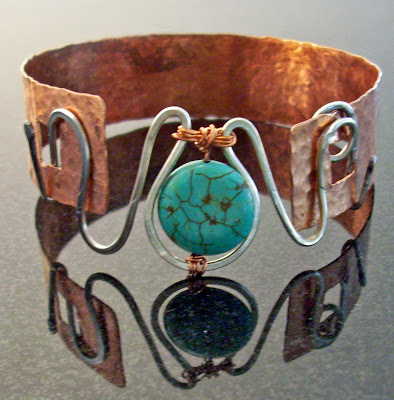 I'm so drawn to copper and turquoise and the silver is a gorgeous touch. This is amazing, Andrea. All that hammering and torching sounds like fun. Half hour, seriously? I think it would be 1/2 a day for me. I think this is really great as is. But I am a sucker for patina and would love to see you do that too! Thankyou Andrea for your visits and warm wishes...it seems all the prayers, good thoughts and fingers crossing is working brilliantly for Miss 11. Andrea...I LOVE the bracelet, OK, OK, I will trade it for anything on my Etsy. You did a fabulous job, I'm soooo jealous. Thank you for the visit and the kudos. Thanks so much for coming to visit me at my Blog and for your lovely words. I really appreciate you taking the time to comment. Would have been fun to have swapped with you and all the other ladies! Some other time, perhaps!